Framed oil portraits of Joseph Ankeny and Harriet Susanna Giese Ankeny. ​Rendered during Joseph's service as Ohio Congressman. Circa 1834-1836. Joseph Ankeny was the last child of Captain Peter and Rosina Bonnet Ankeny. He was born on June 30, 1802 in Somerset, Pennsylvania. Joseph's father died when Joseph was only two years old. Joseph attended school until he was thirteen years old. He learned many valuable life lessons through the school of experience. When eighteen he went down the Ohio River on a raft, the waters were swollen by spring floods and treacherous. The banks were lined with dense forests and Indians. He made his way out to Illinois and then returned to Pennsylvania. He spent time with his uncle Colonel John Bonnet in Westmoreland County, Pennsylvania. He helped his brother-in-law run a general store in Ligonier, Pennsylvania. Without a father, he was encouraged by his older brothers and uncles to settle down, worship the Lord, find a wife and begin a family life. Joseph started attending a church in Berlin, Pennsylvania and listening to Rev. Henry Giese. "He was an early missionary and pioneer minister of the German Reformed Church. He exerted a great influence among the people of his congregation. He was a man of imposing presence, possessed a fine voice and played upon several, musical instruments. He had been educated in Marburg University Germany, for the practice of medicine and had come to the new world with the Hessian army in 1776." (from the writings of Johnson Brigham in "Iowa Its History and Its Foremost Citizens") Although Joseph appeared to be interested in Rev. Giese and the church, he was really most interested in his daughter, Harriet Susanna Giese. Joseph and Harriet Susanna Giese were married on July 29, 1823 in Berlin, Pennsylvania. The bride was attired in a white silk gown, trimmed with a lace ruff. After the ceremony they rode horseback over the mountain road from Berlin to Somerset for nine miles. Nine couples attended an affair the next day. Joseph and Harriet made their home in the dwelling of his father and grandfather before him. They lived on the Somerset farm for several years. Four boys were born to them in Pennsylvania. Then in 1831 they moved westward to Ohio with "the best equipped outfit that ever let Somerset county for the new northwest". They lived on a far in Holmes county, Ohio and then lived in their "mantion" in Millersburg, Ohio. joseph was a leading merchant for the village for two decades. He made frequent trips by stage and horseback to eastern coast factory towns to purchase goods. He owned and operated a large flour mill. He always owned farms and purchased lands in Ohio, Illinois and Iowa. He attended fairs and Masonic festivals. "He was initiated into the Masonic fraternity in 1823. This was at the height of the Morgan excitement. He served as warden and worshipful master of Lodge No. 84 and in 1845 became a charter member of the Spartan Lodge, A. F. & A. M. of Millersburg, Ohio in which he served as first senior warden and treasurer." In 1854 Mr. and Mrs. Ankeny visited the Crystal Palace, established by P. T. Barnum in New York. They were leaders in the social and business circles of Millersburg, Ohio. Joseph was also prominent in political affairs. From 1834 to 1836 he represented Holmes county in the Ohio legislature and on the February 13, 1838 he was appointed postmaster of Millersburg. He was one of the electors who carried the Ohio vote to Washington at the time of Lincoln's first election and returned home convinced from his conversation with Vice President Breckenridge that war was inevitable. He had been a Democrat. He disapproved of slavery but was not an absolitionist. He voted for Fremont and was a devoted Lincoln man. He was a devoted reader of the New York Tribune published by Horace Greeley. He was an uncompromising supporter of what he believed to be right. "Feelings ran high in those days but time softened this and estrangements then begun were forgotten and forgiven in the renewed friendships of later years." Back in Pennsylvania Joseph Ankeny was commissioned Lieutenant Colonel of the Allegheny Jackson Legion of the State Militia, Second Brigade of the Twelfth Division for the counties of Bedford, Somerset and Cambria. He served until he moved to Ohio. He was commissioned, July 4, 1834 as a Brigadier General of the Ohio Militia at a time when muster days were important events. The horse he rode while engaged in military duty became celebrated for his ability to stand fire without flinching. Joseph Ankeny was an advocate of the Union cause He was the past the age for soldier duty but was a stalwart advocate of the war policy and President Lincoln. "In fact his feeling for the martyr president transcended mere admiration." Joseph and Harriet were well known for their hospitality. 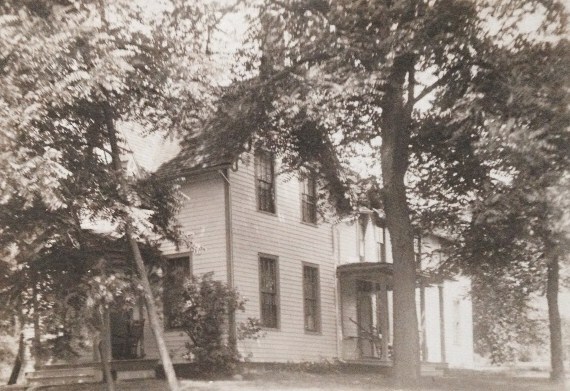 Their Millersburg home was always open for visitors. They possessed the first piano in Millersburg and their household was the center of many social affairs. They mingled with the older and younger people. Joseph and Harriet were raised in the German Reformed faith but while living in Millersburg, Harriet became a member of the Church of Christ. While living in Millersburg, Ohio, Joseph and Harriet became parents of four more children, all girls. Joseph first visited Iowa in 1854 and entered the land north of Des Moines, now known as the town of Ankeny. The war interrupted his plans to move to Iowa; then in 1867 he brought his family to Iowa. A new farm was fenced and improved and an orchard was set out. He was deeply interested in horticulture and did much to promote fruit raising in Ohio as well as Iowa. Joseph, Harriet, and their youngest daughter, Harriet Louise, lived with their oldest daughter, Susan Barcroft, and her family until their new home was finished on the corner of Tenth and Locust in Des Moines in 1871. This new home became the the center of warm-hearted hospitality. In July of 1873 Joseph and Harriet celebrated their 50th wedding anniversary. Numerous descendants and guests attended the grand party. Joseph Ankeny died on May 9, 1976. He is buried in Woodland Cemetery, Des Moines, Iowa. "He was a man of most positive character, strong in his convictions, his opinions, however, being the result of careful consideration His was a splendid record of a self-made man, honorable in every relation in life." Harriet Susanna Giese was born in 1801 in Berlin, Somerset, Pennsylvania. She was the daughter of Anna Maria and Rev. Henry Giese. When Harriet Susanna was just a child her Mother died. He Father had many children to raise and a busy life being the head of a church and so he asked a neighbor, the John Fletcher family, to shelter and care for little Harriet. So the John Fletcher family became Harriet's second family. Harriet would later give the name Fletcher as middle names to her oldest son and to her oldest daughter. Harriet met Joseph Ankeny and they were soon married in 1823 in her Father's church. They lived the first years of the marriage in Somerset, Pennsylvania where they had four boys and then they moved to Millersburg, Ohio where they had four girls. After the Civil War the family moved to Iowa. Their new home on the corner of 10th and Locust in Des Moines became the gathering place for many family, political and social events. Harriet Susanna lived to the advanced age of 96 years and died in 1897. She is buried in Woodland Cemetery, Des Moines, Iowa. Joseph referred to it as his "mantion" in his letters. Joseph's parents were Peter Ankeny and Rosina Bonnet. Peter was the son of Dewalt Ankeny and Mary Jane Domer. Peter was born in 1751. Peter and his two friends, John Walter and John George Chorpenning, were early pioneers into the western part of Pennsylvania and were important to the taming and establishment of Somerset. Peter married Rosina Bonnet whose father, Jean Bonnet, was the proprietor of the first inn west of the Alleghanies on Forbes Road. This inn, called the Bonnet Tavern, still exists today. Peter is a Revolutionary War Patriot and his descendants are eligible for admission to the Daughters and Sons of the American Revolution. Peter Ankeny assisted in establishing American independence while acting as Captain of the Fifth Company of the Third Battalion of the Bedford County, Pennsylvania Militia. A Chapter of the National Society of the Daughters of the American Revolution has been named for him. Peter's sister, Anna Maria Ankeny, married his friend John George Chorpenning. The Rigdon family of Iowa are descendants of Anna Maria Ankeny and John George Chorpenning. Peter died in 1804 and Rosina died in 1845. They are buried in Ankeny Square in the center of Somerset, Pennsylvania. Peter Ankeny gave the town of Somerset the land for a cemetery and school. At the time of his death Peter was the largest landowner in southwest Pennsylvania. Ankeny Square has been designated a historical site by the Pennsylvania Historical and Museum Commission. Harriet Susanna's parents were Rev. Henry Giese and Anna Maria Baker. Henry Giese came to the New World in 1776 as a member of the Hessian army. He met Anna Maria Baker in the New World. She did not want to go to Germany and so Henry Giese chose not to return to Germany. The Reverend suffered disinheritance for his wife's sake. He chose to remain a resident of the New World. Anna Maria was a woman of beautiful and amiable character and assistant her husband in the ministry. They had several children. Their son, Valentine Giese, was a Captain of the Fayette County Blues of Pennsylvania in the war of 1812 and escorted La Fayette through that county when the French General visited America in 1824. He was also a friend of General Jackson and visited the White House. Harriet Susanna gave her brother's name, Valentine, as the middle name to her own son, Rollin Valentine Ankeny. The name Valentine surfaces many times in the Ankeny family. Peter Ankeny's father was Dewalt Ankeny. Dewalt came to the New World on the ship Neptune with his uncle, Caspar in 1746. He owned property in Lancaster County and Bedford (later Somerset) County, Pennsyslvania. He was a Revolutionary War Patriot because he supplied food, supplies and shelter for the Colonial Cause. He is the patriarch of many descendants within America. He married Mary Jane Domer who is the mother of Peter Ankeny. After her death in a fire, he married a widow, Margaret Becker Frederick. Both Dewalt and Margaret had children from their previous marriages when they married; and then they together had many more children. Inscription: "To the Memory of De Walt Ankeny, the first of his name and the founder of that family in America, one thousand seven hundred forty six, born 1733 died at Clear Spring, MD., 1781." Johann George Frederick ANKENEY was the son of Noah Frederick and he was born after Noah was killed. He was just an infant when Dewalt and Margaret married. Dewalt raised "John" as his own son and gave him the name ANKENEY. John's grandson, Joseph Ankeney, also moved to Des Moines, Iowa. That family lived near and socialized with the Joseph and Harriet Ankeny family. The Ankeneys were owners of the Linseed Oil Company. Joseph Ankeney is also buried in the Woodland Cemetery. Joseph Ankeney is descended from Margaret and Noah Frederick. Joseph's sister, Rachel, married Charles Getchell and they lived next to Joseph and Harriet Ankeny near the corner of 10th and Locust in Des Moines.